Steampunk is a great genre, the creativity of those who write within it is deep and fascinating. With the simple requirements of a world where clockwork and steam technology have allowed humankind to create engineering miracles - it is very much sci-fi in the era of Edgar Allen Poe and HP Lovecraft. Which is why I find myself wondering at the lack of steampunk horror. Most of what exists is in cos-play and modelling. As literature, I think a sub-genre of steamhorror is as popular as sci-fi horror. A minority group within a genre. 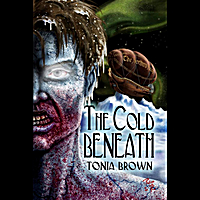 Tonia Brown's brilliant steampunk horror novel "The Cold Beneath" has been brought to life in a new audiobook edition by rising star Chris Barnes of Dynamic Ram Audio Productions. Chris has spent the last year building a portolio of audio book productions for pulp publishers Airship 27 and Pro Se Productions producing such voice talents as Fiona Thraille. The book itself is well suited to the audio book narrative treatment, written in the first person, a memoir of a dying man trapped in an Arctic hell. Chris' natural Scottish brogue is evident only in the introduction, and when he voices the dialogue of the single Scots character in the story. Other characters inlcude an American and a woman. The accents and voices for each are unique. The rest of the time he reads in the main character's voice, a smooth, warm English accent that is both clearly enunciated and delivered at an easy listening pace. From a technical point of view the production is professional, and well worth the $9.99 for the full audio book edition. With no music, and no breaks in the story it is very easy to lose yourself in the telling of the tale of bio-mechanical genius Phillip Syntax and the tragic expedition he joins seeking the North Pole. The characters are detailed and complex, Syntax has a background of betrayal and lost love, the expeditions leader is Gideon Lightbridge, a Civil War veteran with mechanical legs (designed by Syntax). When their prototype airship crashes in the frozen wastes, the true hororr begins. The Cold Beneath is a masterwork of character, steampunk and above all horror, and like revenge and gazpacho soup, the audiobook version is delivered with a delightful chill. Get a copy, listen to it, you will not be disappointed.